People who want their own keepsake of Coventry can now have their very own Cross of Nails, courtesy of a city jeweller. 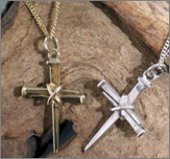 The silver and gold crucifixes in the style of the city’s famous symbol are currently on sale at Francis and Gaye Jewellers in Cathedral Lanes Shopping Centre. They are already proving a hit with people in the city, and are fast becoming popular presents to send to relatives who have moved abroad. £1 from every silver cross of nails, and £2 from every gold model, will be given to the Coventry Cathedral Development Fund. Boss Roger Francis said the crosses had been designed with the blessing of the Cathedral. Mr Francis added that the cross came as part of a good package, which includes a free chain and box. “I would like to say they are limited edition, but we don’t know how many we will sell. “I expect they will be popular as gifts at Christmas and Easter. “Because of the nature of it I don’t expect a lot of interest from visitors from London or Edinburgh, but there is a lot of local interest.